Tired of your choppy Netflix experience? Maybe you should move to a different state. As news spread earlier this month about South Korea’s blazing internet speeds and Australia’s sagging broadband adoption rates, thought leaders in the USA looked within to see how different states compared to one another. Some states have made significant improvements to their broadband speeds, while others—one state in particular (see below)—have remained nearly stagnant for the past three years. How does your state’s internet stack up? Washington D.C., which Akamai Networks includes as a state in the quarterly , leads the United States with a 22.5 average Mbps speed. As for last place, Idaho provides its citizens with an abysmal average broadband speed of 10.6 Mbps. That’s 11.9 Mbps behind the leader—evidence that while most pundits enjoy discussing the wage gap, a growing “internet speed gap” may be a genuine concern. Image by Broadview Networks. Data by Akamai. Broadview Networks recently used Akamai’s data to create a (see header image) showing which states had “hot” and “cold” broadband capabilities – the graph to the left provides a complete list of state rankings. 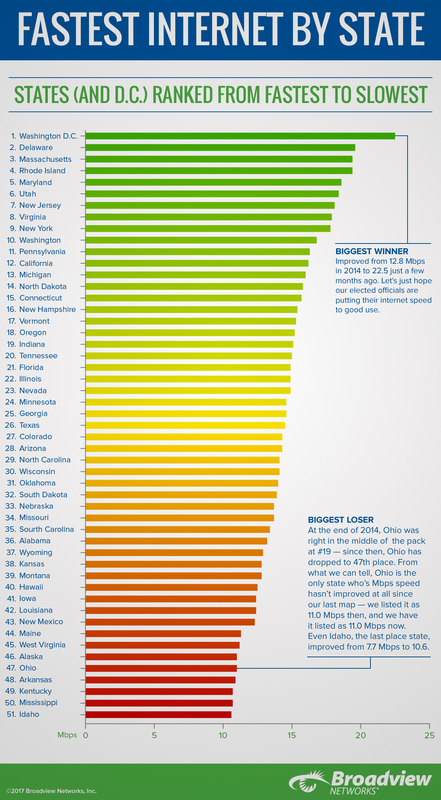 As noted on the infographic, Ohio was the only state that failed to improve its Mbps speed since 2014; as a result, the state dropped to 47th place in the United States. How Does the US Stack Up Against Other Countries? As you would expect, the internet speed disparity only grows on the international level. Larger countries generally struggled to break into the top ten–Japan, ranked #9 by Mbps according to Akamai, is the only “large” country in the top ten. Japan has a population of 127.3 million. The United States ranks fifteenth on the world stage despite large geographical areas with sparse population. Most countries ranking above the USA have populations loosely resembling an average US state (Japan and South Korea being exceptions). Overall, states and countries with denser–and not necessarily higher–populations rank higher for internet speeds. On the international scale, countries such as South Korea, Japan, and Hong Kong rank in the top ten. On a national level, the US “heartland” remains mediocre at best when it comes to internet rankings (Utah being a striking exception). Densely populated coastal states fare better. Advancements in satellite and fiber connections, as well as increased motivation in developing countries like India, may significantly alter these rankings by 2018. For now, let’s hope the political “swamp” in D.C. makes good use of its broadband.